North Korean defectors are vulnerable following controversial interviews aired on a South Korean television network last week, featuring the manager and a few of the North Korean waitresses of a group that fled a Pyongyang-run restaurant in 2016, according to activists and human rights groups. Jihyun Park, a North Korean defector and activist based in Britain, told UPI in a recent Skype interview improved relations between North and South Korea has generated new anxieties among refugees even as diplomacy has provided a welcome respite for most South Koreans. Park, who is active on social media and keeps close communication with defectors in the South, said North Korea has been getting what it wants even before the Panmunjom Declaration, signed at the border by the two Korean leaders, has passed through Seoul's National Assembly. Even as the bill is pending, South Korea took steps that are striking fear in defectors' hearts, Park said. The "ripping out" of loudspeakers that played Korean pop songs and broadcasted censored news like the assassination of the North Korean leader's half-brother Kim Jong Nam, was seen as a goodwill gesture by the South ahead of the April 27 summit. But the action may have been requested by the North, to send a message of warning to defectors in the South, the activist said. "North Korea is the world's worst human rights abuser," Park said, adding the loudspeaker dismantlement made dissidents feel politically insecure. Similarly, the latest controversy over the 12 North Korean waitresses and their manager is stirring old fears of forcible repatriation. Park said it is likely Heo Kang Il, the manager who interviewed with South Korean network JTBC, was threatened in some way by North Korea, and may have chosen to speak up after two years of silence. While Heo's motives are the subject of speculation, his claims the group was "lured and kidnapped" by South Korean agents can be easily dispelled, Park said. Park, who once walked with bleeding bare feet while serving time in a North Korean prison camp after being repatriated, said Heo's story "doesn't make sense." The group transited through Malaysia and was processed through the South Korean embassy in Kuala Lumpur. They knew they were traveling to Seoul. If they did not want to take the passage to the South, they could have refused to enter the embassy, but instead, they went in voluntarily, Park said, as she ruled out an abduction motive. Greg Scarlatoiu, executive director of the Committee for Human Rights in North Korea in Washington, said claims of a South Korean spy agency abduction of the North Koreans has absolutely no credibility. "There are 31,000 defectors in South Korea," Scarlatoiu told UPI by phone Wednesday. "Why would the South Korean government need to abduct North Koreans?" 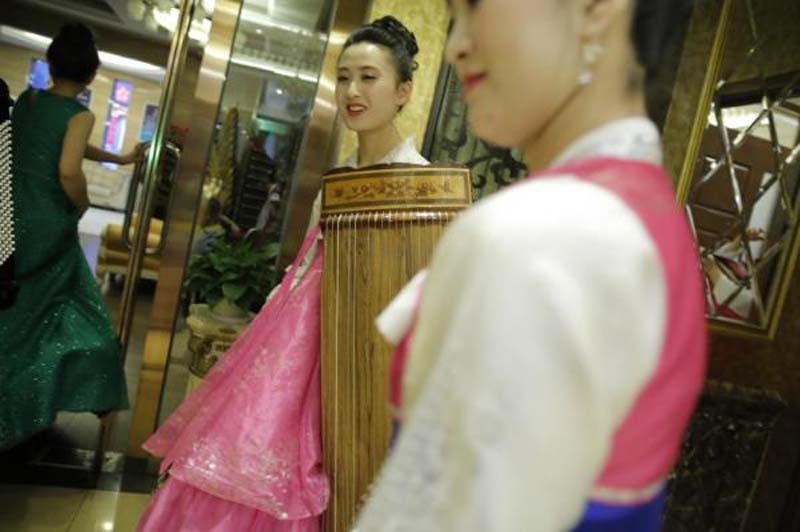 The human rights advocate said North Korea is picking on the waitresses because it is a high-profile case. "They would really like to see one or two or all of them return to North Korea to make an example out of them, to threaten others, make sure they don't defect, [as well as] threaten defectors in South Korea as well," Scarlatoiu said. "The regime is very bothered by the findings of the United Nations Commission of Inquiry, and they want them to go away." The raising of the issue of the waitresses is dividing South Korean society. On Monday, progressive legal organization Minbyun held a press conference, calling for the truth to be revealed regarding the "kidnapping" of the North Koreans. "Minbyun claimed the rights of the North Koreans are being abused, but they themselves are engaging in the abuse of South Korean citizens [defectors] by calling for their repatriation," Park said. Members of Minbyun are supportive of reuniting the waitresses with their families in the North. But such a move would be in violation of international pacts, including the 1951 United Nations Refugee Convention, Scarlatoiu said. "The South Korean government has to be very careful in handling this case," he said. "North Korean escapees in South Korea and elsewhere need protection. North Koreans and the NGOs they run need assistance. They need support."